In re: Aramack Sports, a case from the U.S. Court of Appeals for the Tenth Circuit, involved a recreational boating accident in which four people were killed. All of the victims were adults who had rented a boat from defendant for use on Lake Powell. The question on appeal was whether this case fell within the federal admiralty jurisdiction. While we generally think of a lake as an isolated body of water, in some cases, the lake is considered navigable, and if waters are considered navigable, then any causes of action that arise on there may fall under the jurisdiction of federal admiralty court. In this case, defendant rented boats from a marina on the lake, which is situated near the border of two states. Three married couples had gone on a joint vacation to the lake and rented a boat from defendant. When they went to the defendant’s place of business to get a boat for the following day, they were required to sign a contract for the boat, a Baja 202 Islander. This boat was certified as a class C design and rated to withstand certain wind and sea or water conditions, according to the owner’s manual, which was submitted into evidence as part of this case. The boat had a rating to withstand wind speeds up to 31-miles-per-hour (27 knots). 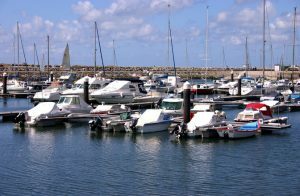 However, in the owner’s manual, it states that it does not mean that all occupants will survive in these conditions, but rather that most experienced operators could operate the boat safely in these wind and wave conditions. The manual also tells users not to take chances and head for safety if they are caught in high winds or bad whether. On the day the party rented the boat, winds were forecasted between 15-to-23-miles-per-hour, but the forecast was later updated to winds of 25-to 35-miles-per-hour. They also predicted gusts up to 55 MPH. When the party arrived at the boat rental facility, they were told they could get the weather channel on the boat’s radio, but they were not told of the actual forecast that day or the 55 MPH winds. They did not ask for the weather report, according to court records. They left on the boat that morning and arrived at Rainbow Bridge, which was their plan. On the way home, they stopped to refuel at another marina that was also owned by defendant. The attendant at that marina told them that if they were not comfortable with the weather, they should stay there. The trial court never ruled on this issue. On the way home, the weather got bad, and the boat sank. Two of the three couples lost their lives. Their surviving family members filed a wrongful death lawsuit. Defendant filed a petition for limited liability under an admiralty act on a basis that this occurred on navigable waters. The court denied the petition on the grounds that this was not an admiralty case. However, on appeal, the court, recognizing that they rarely have to deal with admiralty law, found that these principles did apply and the court needed to review its findings. The issue in part was that the lake spanned multiple states.